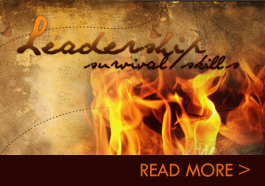 Just as in the wilderness, where skills such as building a fire are needed to survive, every leader needs essential skills to survive the workplace! This practical, yet powerful training series is packed with adventurous experiential learning activities that bring training to life. It empowers leaders with the tools they need to enrich their work experience, to exert increased influence in their organization, to strengthen teams, and to free up time needed to focus on accomplishing the organization’s noble mission. This training program can serve as a leadership primer for new or aspiring leaders or as a refresher for the most experienced of leaders. 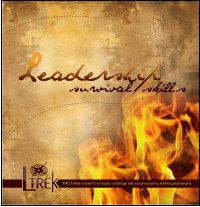 All participants are sure to gain from this leadership survival skills training series. Leaders explore the characteristics of a great leader, the connection between a leader’s actions and the success of an organization. Participants consider how leaders are developed. Are they born great leaders or are they made? Participants discover how essential leadership skills can help them to survive the workplace. They explore the potential benefits that leadership development can provide leaders. They identify personal leadership strengths and development needs, examine barriers to their development, and find solutions for overcoming perceived challenges. Like water in the wilderness, the ability to motivate others is a leadership essential in the workplace. Yet, in order to motivate others, leaders must first be motivated. Participants analyze their own motivation level and consider how others may perceive them based on their actions. Participants discover ways to maintain or increase their own motivation level, should they need it. Participants explore tried and true strategies for motivating others, and bust a few myths about motivation along the way. Some challenges are only solved through interdependence, not rugged independence; it takes a team! Participants explore the four phases of team development and discover actions that they can take to move teams beyond each phase more efficiently, even when they are not in charge. Team games spark discussion about the dynamics and behaviors of highly effective teams. Each participant is given a “Team Compass” to help their teams to find direction, reach goals or to get back on the trail. Delegation is often thought to be the most challenging of leadership survival skills, even for highly informed and experienced leaders. Participants explore the benefits of delegation and the reasons why we fail to delegate. They learn the five steps of effective delegation that can help reduce the risk and potential conflict involved in delegating. How a leader communicates is just as important as what he or she communicates. A balanced communication style is a key to success. If a leader is overly assertive or passive, he or she risks losing influence. Through self-reflection and exploration, participants discover how a balanced communication style can maximize their level of influence and persuasiveness among others in the organization. Conflict is like fire. It is necessary but dangerous. It can be extinguished or spread. Conflict is also a reality in our lives and in every organization. Leaders must learn to anticipate and manage fire, rather than escalate or ignore it. Through role-playing, participants learn the win-win approach to conflict, which has the power to enhance work satisfaction, increase confidence, reduce stress, and improve results. Goal setting is critically important to leadership development. Participants reflect on leadership survival skills they have learned and determine which skills are critical to surviving and thriving in the workplace. What would make the most difference in their experience? Which skill would help them gain the most influence within the organization? Participants explore the benefits of goal setting and the potential barriers to their growth. Each participant develops and shares his or her plan of action. All of us respond to conflict differently. Some of us are avoid conflict, some of thrive on it, others just want us all to get along. Oftentimes, we intend to work together but our own conflict styles get in our way and make matters worse! Identify your predominant conflict mode and determine when it is advantageous and also when it’s inappropriate. Discover the value of all of the common conflict modes and when to use each, depending on the circumstances. Includes – TKI Assessment Delivery and Conflict Style Activities. Most of us are downright skillful at starting a fire. That’s right, because conflict is like fire. It’s necessary, but dangerous. It can be extinguished or spread. Whatever the case, conflict is a reality in our lives and in every organization. We must manage it to survive! Before we manage it, we must be able to identify common causes of conflict. Together we will explore destructive conflict causers. How do we avoid them? How do we respond to them? Come discover simple techniques for overcoming every day fire starters and for managing difficult conversations. Conflict Management Simulations and Difficult Conversation Preparation Activity Included. Prerequisite: Introduction to Conflict Styles and TKI Assessment. Readings Recommended. In an increasingly competitive business atmosphere, leaders must collaborate with others to find mutually acceptable and innovative solutions! It is imperative that leaders discover the power of integrative negotiation to save time, energy and organizational resources! Using integrative negotiation strategies, we can find and create solutions we may otherwise overlook! What is “integrative negotiation?” Come learn strategies for finding everyday win-win solutions in the workplace. Multiple Negotiation Simulations Included. Readings recommended. Conflict and Teams Round Table (3.0 Hours) Just as individuals have predominant conflict styles, so do teams. This session builds upon the Conflict Styles presentation and applies it to how the team deals with conflict. Teams develop a plan for how they will handle conflict in the future. Prerequisite: Introduction to Conflict Styles and TKI. Custom topics to be developed as needed.